Strangers in Their Own Land: Anger and Mourning on the American Right – loudlatinlaughing – Euge! Euge! Wow wow wow. Arlie Russell Hochschild leads the pack of authors helping to explain the unexplainable—namely, why those poor folks on the Right who are directly impacted by pollution and income equality are supporting candidates looking out for big business and small government. 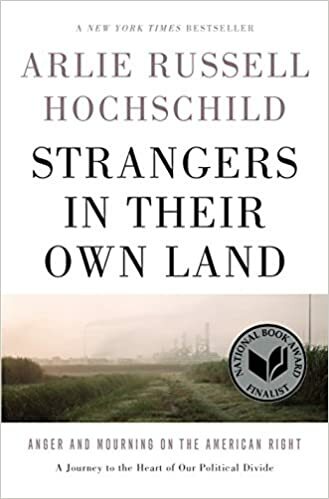 I’ve been reading a lot of sociologists lately for their take on this issue, but Hochschild is the clear winner. From my safe perch in San Francisco, she can actually make me scale the empathy wall and, if I squint, see things from the perspective of the other side, mired in sink holes in the Louisiana swamp she spends five years studying. At no point does she pander to them or to us, her readers. In fact, the book is a marvel in terms of balanced, respectful writing—if she gave every one of her interview subjects a copy of it, none should be offended. One thing that struck me early as I was reading was the connection between money and religion. Both of these concepts make people feel comfortable; with money, you buy leisure, with religion, you buy afterlife. Several of the folks she interviews belong to a Pentecostal church—the type that believe in The Rapture and speaking in tongues. With this in mind, their carelessness about the environment makes perfect sense. They actually believe themselves to be living in End Times (and who knows! maybe we are! sure feels like it), so the earth will purge itself for 1,000 years and then come back a paradise. “The earth will burn with fervent heat,” is one quote from the book of Revelation. The marriage of the 1% ultra rich Republicans who run for office with religion was super smart. This is one aspect that these people will not compromise on. “We vote for candidates that put the Bible where it belongs,” says one. The part of the book that struck me most was her exploration of everyone’s “deep story”—everyone’s waiting in line for the American Dream and they are patiently waiting, it’s hot out, the sun is beating down, and the line’s not moving. Sometimes it seems they’re going backwards. And then, a group of people cut in line (e.g. woman, blacks, immigrants). And it seems like Obama is encouraging them to cut in line, and isn’t he a line cutter also? (How else did he get into Harvard). But this craving to earn lots of money lingers, and there is worship of successful businessmen. With lots of the men Hochschild spoke with, “the repeated term ‘millionaire’ floated around conversations like a ghost.” Identifying with the 1% was a source of pride for Tea Partiers, showing that you were optimistic, that you tried. The Tea Party has a long history of electing people who do exactly what they say, shrink government, and ravage the land. They don’t like the results, so they vote him (usually a him) out, and elect a Democrat who hikes taxes and then start to complain about that, with a short memory of the terrible things that happened without government spending. We blue states benefit from this attitude. We get less pollution but still reap the benefits of the products coming out of red states. This is a tremendous book. Highly recommended. Author lzPosted on June 21, 2017 Categories Arlie Russell HochschildTags sociology, YES! Next Next post: I Know I Am, But What Are You?